MR. GREGORY: Where do you see unemployment as we move through the rest of this year and beyond? 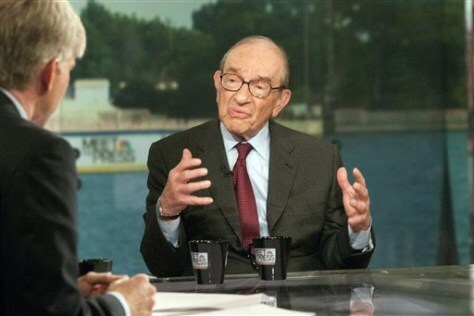 MR. GREENSPAN: I feel we just stay where we are. The -- there is a gradual increase in unemployment, but not enough to reduce the level of unemployment. MR. GREGORY: We're at or about 10 percent. MR. GREGORY: Right. But I'm saying, is that where we remain, do you think? MR. GREENSPAN: Yeah, yeah. I, I would say that there's nothing out there that I can see which will alter the, the, the trend or the level of unemployment in this context. MR. GREGORY: Interest rates , how long before they start coming up? Do they need to stay low? MR. GREENSPAN: Well, the problem there implies that the government has control over those rates, meaning the Federal Reserve and the Treasury Department , in a sense. There is no doubt that the federal funds rate , that is the rate produced by the Federal Reserve , can be fixed at whatever the Fed wants it to be, but which the government has no control over is long-term interest rates , and long-term interest rates are what make the economy move. And if this budget problem eventually merges to the point where it begins to become very toxic, it will be reflected in rising long-term interest rates , rising mortgage rates , lower housing. At the moment, there is no sign of that, basically because the financial system is broke and you cannot have inflation if financial system is not working. Alan Greenspan says there's a "pause" in economic recovery, that feels like a "quasi-recession."